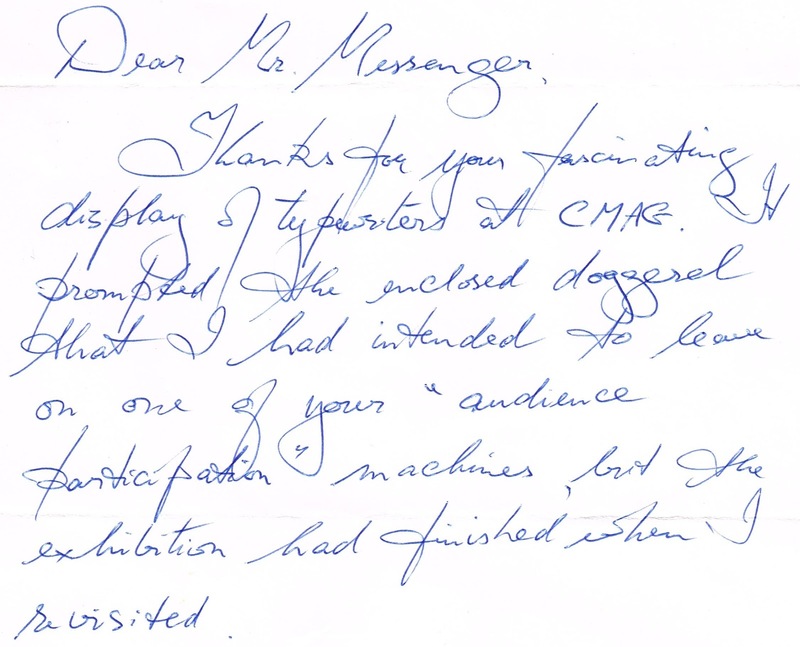 Far and away the highlight for me in this memorable typewriting year was the two-month Typewriter Exhibition held at the Canberra Museum and Gallery from July to September. The exhibition was seen by 12,000 people. Naturally I had a number of "thank you" letters to write to museum staff, most especially the exhibition curator Rowan Henderson (below). 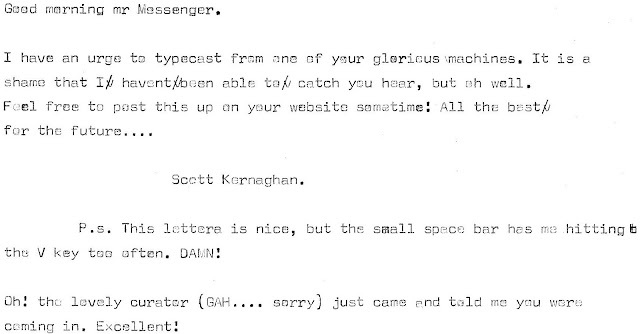 Happily, because of the many images of old typewriter company letterheads offered online by Georg Sommeregger and Richard Polt, I was able to typewrite these letters on a range of different pages. 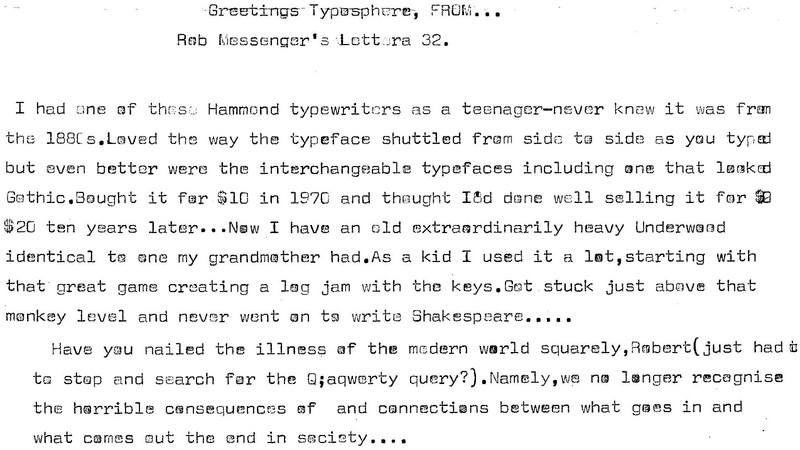 One reply noted, "I had forgotten the delightful feel of the indentations on the reverse side of a typewritten document!" Now there's something we don't think about very often! The museum's director called the exhibition "a great success for us and extremely popular with our visitors". It was pleasing that in an article on the National Library of Australia's website, headed "A reflection on the National Library of Australia’s Treasures gallery", Michael Piggott wrote, "The Library’s premier gallery can also now demonstrate that an exhibition of content for its own sake actually can work, if cleverly thought through and appropriately disguised within legitimate micro themes. 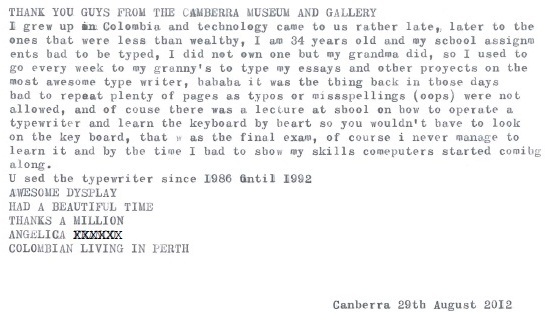 Good examples where the message is the medium abound, such as the recent exhibitions and matching publications from the State Library of New South Wales (ONE Hundred), the British Museum and the BBC (A History of the World in 100 Objects) and the Canberra Museum and Art Gallery (From A to Z: Robert Messenger’s Typewriters)." In the commentary, a photo from the exhibition was captioned: "One man’s treasure: an eclectic collection of typewriters on display ..."
In the aftermath of the exhibition, Rowan Henderson passed on some other small mementos, such as letters written by Scott Kernaghan and others on public use typewriters (including an IBM Selectric with a Blick keyboard). What a fitting tribute to one, if not THE best typewriter collection (and collector!) around! Congratulations! 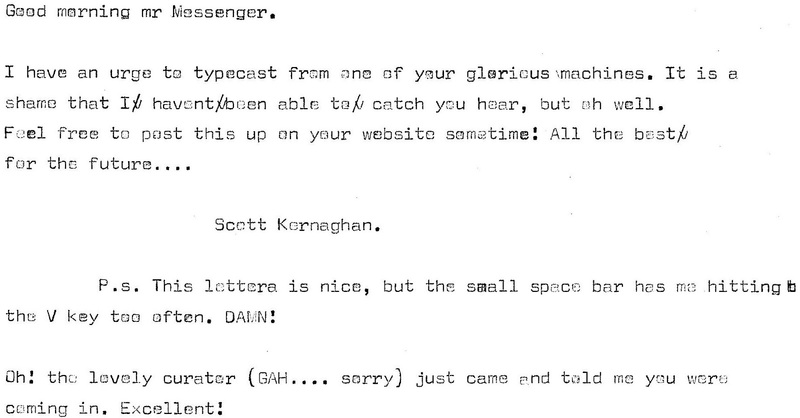 Robert, I think I speak for many collectors when I say that your fantastic blog and incredible collection has inspired a lot of us to pursue our hobby and save one more typewriter from the landfill, at least for a few more years. Congratulations, and thank you for sharing all that fantastic knowledge of yours! What wonderful mementos, and what a great experience. I've never had the chance to put on a public display of my machines, but just found out that I will be able to show a few typewriters in a display case in our university library. Someday -- 12,000 visitors?? I can dream. Oh dear god. There's my horrendous spelling for all to see for eternity! Rob, this really was a special exhibit, and I'm glad to have been a tiny part of it. But most importantly, it is great to have seen such enthusiasm for your collection! You have a unique knowledge and passion, and this really shows how much of a treasure it is. What a warm and fine memory. The booklet seems very nicely composed. Thanks for using the letterheads, I will see to make many more in 2013. Long live typosphere friendships! Those are some great mememtos from a wonderful exhibit I wish I could have seen. I am sure you have many many wonderful memories of the event. Congratulations on the 12,0000 visitors. That is super! Keep up the excellent work Robert.